Happy birthday Tedd Arnold (Hi! Fly Guy), Mary Anderson (The Rise and Fall of a Teenage Wacko). It’s the birth date of Joy Adamson (1910–1980) Born Free, and Helen Hoover (1910–1984) A Place in the Woods. In 1885, L.A. Thompson patents the roller coaster. Read Roller Coaster by Marla Frazee. The first official basketball game is played in 1892 at the YMCA in Springfield, Massachusetts. Read Basketball (Or Something Like It) by Nora Raleigh Baskin. From January 19–25, we celebrate Hunt for Happiness Week. 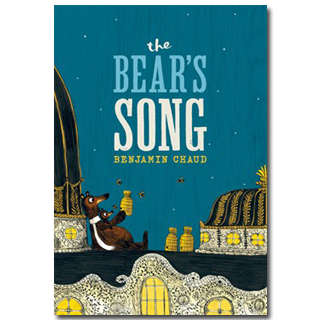 A perfect book for this week has been sitting on my shelf for months: Benjamin Chaud’s The Bear’s Song. A large picture book at 14 ½ inches tall by 9 ¾ inches wide, The Bear’s Song first appeared in France and has been published in the United States by Chronicle. It tells the story of Papa Bear and Little Bear, who face the beginning of winter. While Papa begins hibernation, Little Bear, longing for honey, rushes off when he hears a buzzing sound. Papa chases him through a vibrant forest, into the busy city, and finally inside an opulent opera house. In desperation, Papa comes up with a brilliant idea to help locate his cub. They finally reunite and sit together on the opera house roof, “under the stars and among the beehives,” finding honey and happiness together. Readers can pore over each of the book’s elaborate double-page spreads multiple times to find the location of Papa, Little Bear, the bee, and a large cast of background characters. 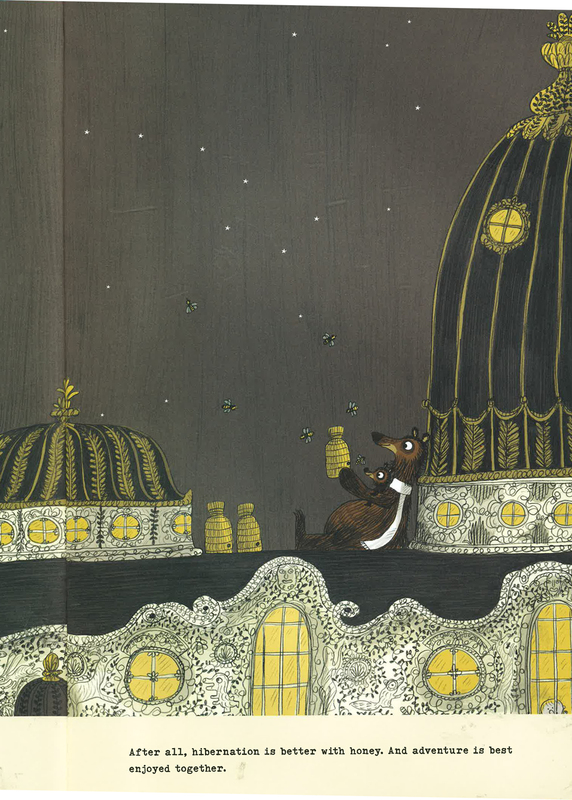 A very elegant French Where’s Waldo, The Bear’s Song provides a visual feast for the eyes on every page. Endpapers decorated like honeycombs round out this delightful fantasy, and the entire book has been given Chronicle’s superb attention to design and production. This book is so attractive that even if you didn’t want to read it, you would want it sitting on your bookshelf. So if you want to add a bit of whimsy to classroom units on winter habitats and hibernation, The Bear’s Song provides an enchanting introduction to the topic for very young readers ages three to eight. Even more important, it helps children develop visual literacy as they decode Chaud’s intricate and fascinating drawings. I hope you enjoy celebrating Hunt for Happiness Week. I myself rarely have to hunt for it—because I so often find it reading the pages of a new book. Originally posted January 20, 2014. Updated for . My two year old grandson and I love this book….its size, its illustrations, its wonderful bear, its “together” theme. Lately, I’ve come to realize that if I don’t have a new children’s book on hand to read at all times, I feel like there’s something not right about my day. Hunt for Happiness Week? I love it. I just ordered this book the library. I’ve been on the hunt for a delightful book to donate to my daughter’s first grade classroom. This one looks like the one! I can’t wait to get my hands on this! Gordon and Star: Glad to introduce a new book to you today. Carol — thanks for the reader report.